Regular readers know my love for chickpeas. I love my Gingery Marinated Chickpeas (Greta Garbanzo https://hotcheapeasy.wordpress.com/?s=greta+garbanzo&submit=Search,) but decided it was time to freshen up my outlook. 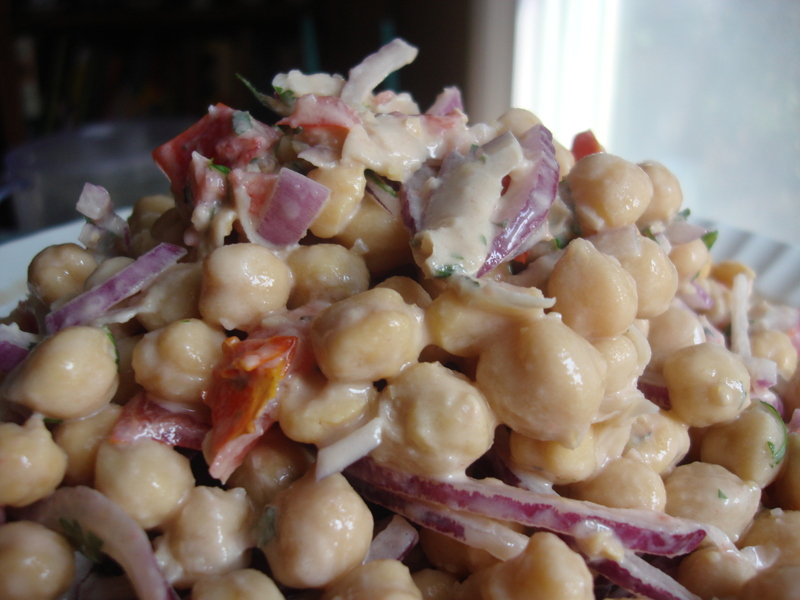 Thus, this Chickpea and Tahini salad…perfect to accompany summer BBQ or Mediterranean buffet, an excellent side dish to just about anything, and best of all, easy! I made this a few hours ahead, and the little bit that remained made for great leftover snack lunch! Toss dressing in salad. Salt to taste. I’m a big fan of chickpeas too! Always looking for new ideas and I love the mix of herbs you included in this salad. Sounds really delicious! I like this, it’s almost like a deconstructed hummus.